The first thing I wanted to bake with my fresh tin of matcha, green tea powder, is none other than a loaf of bread. Having tried both tangzhong or water-roux (汤种法) and scalded-dough (烫种法) methods to make bread, this time I returned to my usual straight-dough method (直接法). This happens to be the busiest month for me. I have two kids who are sitting for their exams one after another. Even though I do feel anxious for them, I still leave them to revise their work on their own. I am pretty hands-off this time, not sure what's the reason, but I guess maybe I am so used to them having one exam after another, I am less uptight about it as compared to the previous years. I even go to the extent to delegate my 'job' to them...the two brothers will revise with each other. The younger fellow, who is more vocal and expressive, will help his brother practise for his oral exams; while the elder one will go through Maths and Science with his brother. It is a win-win situation, as both of them enjoyed each others company, way better than having me around to breath down their necks. To make myself feel less guilty, I sat down with the little one to go through his studies after I left the dough to proof in the bread tin. I was so engrossed with the revision that I almost forgot about the dough. By then, the dough had already reached the rim of the pan and it expanded further upon baking. Since my oven was so small, I had to cover the top with foil to prevent it from getting burnt. As a result of over-proofing (close to 2 hrs), the holes in the bread crumb appeared to be larger than usual. I stored the bread in an air-tight container. After two nights, the bread felt a little dry (by touch)...just like the two end pieces you get from commercial store bought loaf bread. However, they still taste as soft and good and won't stick on to the roof of you mouth. I plan to make another loaf bread using the tangzhong method, just to make a comparison and to convince myself that bread made with tangzhong would indeed fare better. Mix matcha powder with hot water to form paste, set aside. Stir bread flour, caster sugar, salt, and instant yeast in a mixing bowl. Make a well in the centre, add in egg. Reserve about 30ml of milk and add the rest into the mixing bowl. Mix the ingredients with hand and slowly form into a rough dough. Add in a little of the reserved milk if the mixture is too dry. Transfer dough to a lightly floured work surface. Knead the dough till smooth. Add in the reserved milk a little at a time, knead well after each addition. (This way, the dough will not be too wet and sticky). Use up all the reserved milk. The whole process should take about 10mins. When the dough is smooth, knead in the butter. Continue to knead the dough until it no longer sticks to your hand, becomes smooth and elastic. This should take about another 15 to 20 mins. Do the window pane test: pinch a piece of the dough, pull and stretch it. It should be elastic, and can be pulled away into a thin membrane without tearing/breaking apart easily. Divide the dough into two equal portions. Knead the matcha paste into one of the doughs. Knead till dough becomes smooth and the matcha paste is fully incorporates into the dough, takes about 5 mins. Place each dough (separately) in lightly greased (use vegetable oil or butter) mixing bowls, cover with cling wrap and let proof in room temperature (around 28 to 30 degC) for about one hour, or until double in bulk. Remove the doughs from the bowls and give a few light kneading to press out the gas in each dough. Roll into rounds. Cover with a damp cloth or cling wrap and let the doughs rest for 15mins. On a lightly floured surface, flatten each dough and roll out into a rectangular shape, about 20cm x 40cm. Place the matcha dough over the plain dough. Starting from the shorter side, roll up the dough tightly, make as many rolls you can. The resulting roll/log should be around 20cm in length. Pinch and seal the seams. Place dough seam-side down in lightly greased bread tin/pan. Cover with cling wrap. Let the dough proof for the second time, until it fills up 80% of the tin/pan. Brush with egg wash.
Bake in pre-heated oven at 180 ~ 190 deg C for 30 to 35mins. Unmould the bread immediately when removed from the oven. Let cool completely before slicing. Once cooled, store immediately in air-tight container. Wow, your bread looks so beautiful and pro! Like breadtalk's! I have problems with separation of the different dough after baking. Like having tunnels in between. Do you know what's the reason? Tks. Beautiful as always :) I have to try it out some day when I can get my hands on some matcha powder. Cupcake, I am not sure, but maybe the two doughs were not roll up tightly? or you may have over proof the dough during the second proofing? To avoid this problem, you can bake with a pullman tin with the cover on, this way, the doughs can stay together? Bee Bee, I didn't want to add too much matcha powder as I am worried that it will make the bread dry...matcha powder tends to absorb moisture, and will cause baked goods to turn dry. So neatly sliced and what a nice colour combo! its perfectly done =) I like how the bread look, so artistic.. haha.. The swirls is beautiful, must try out one day. I am happy seeing your matcha bread so beautifully swirled. And I love the texture of your bread :) Thanks for sharing the recipe. I want to try my hands at making them :) Hopefully it will turn out nice like yours. 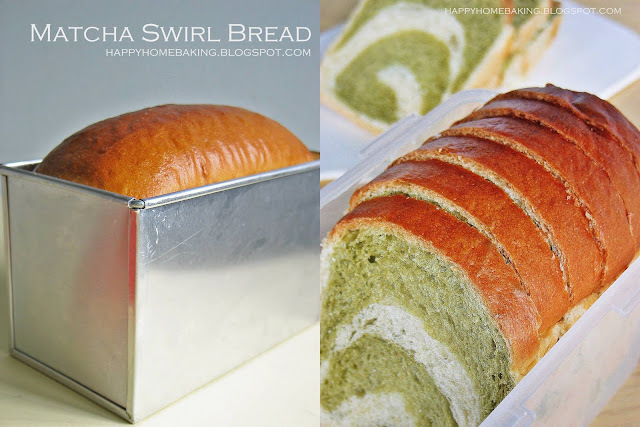 Very nice swirl matcha bread you have. I also just made a loaf of Hokkaido milk bread using the straight dough method. Your bread rose very nicely above the rims. And the browning on the top is very nice. May I know what oven are you using? No matter how low I placed my bread, it'll always "blackened" pretty fast. HHB, I wish I can be laid back like you. This year, my gal don't have CA2 and I am getting concern for her final year. haiz... i wish I am like you so chai. Anyway lovely bread and the green comes out beautifully as well. Can tell me where your hubby buy that bread slicer. It looks cool. Nothing beats home-bake loaf with such beautiful swirl and neat slice! I'm sure its just as flavorful of matcha. HHB, take care amid the busy schedule! I always love to look at your breads and buns! The crumbs are just so beautiful! The swirling is very nice! As for bread slicer, I'm not that particular about getting even slices ... LOL ... which explains why I'm so sloppy ... Haha! Hi HHB, ur kids are well taught by u tat they are able to help each others on e study *envy*. I love e swirl method of e bread n e color, so beautiful. The bread is look even more prof than store bought! Oh..what can I say... Your bread always look amazing! Beautiful in both swirl & colour combination of bread. Hi Jane, yes using alum foil is no good. I try to avoid using it too. I have tried covering it with baking paper, but the paper almost turn brown :( So sometimes I will use one layer of baking paper (cover the bread) and another layer of foil on top. I don't like to use egg wash actually (if you see my previous bread posts) as I prefer a 'matt' finish...I don't like it to be glossy, greasy looking. However, whenever there is leftover egg from the recipe, I will use it as egg wash.
Hi, Did you entirely knead the bread by hand or did you use an electric mixer? Lara, I knead the dough entirely by hand, I do not have an electric mixer that can be used to knead dough. Lovely bread, I also want to try this. But I have not bake any bread since....I also can't remember...;p Got to push myself abit more..heehee! just loved, did bread yesterday, plain, and loved, next time will add some color. tks. I just made bread 2 weeks ago but my breadmachine died on me. Had no choice but to handknead. It was really therapeutic spending 30 mins to pass the window pane test. But I was racing with time as DD3 was taking her nap and was worried she may wake up cranky while my hands were full of sticky dough. Thanks for sharing the info on where to get the bread slicer. BTW, any idea how much it cost? BTW, I love the brown crust on your bread! Blessed Homemaker, your breadmachine died too?! I hope you have a standing mixer to help you knead bread by hand. Kneading by hand is ok, once in a while, but I make bread almost once a week, so it can be very tiring, and time consuming. Once, I was kneading dough half-way when my younger one came along complaining his eyes itched, so I had to wash up and applied eye drops for him (he was suffering from some allergy). The bread slicer is the same price as shown on the online store so it is around S$14. This slicer allows you to select the thickness (ranging from 8 to 12 pieces per loaf). There is another type from this local baking supply store, (http://www.kitchencapers.net/shopstore/bakeware.htm). This one comes with a fixed thickness though. Must the dough pass the window pane test? I have never achieve this but so far my bread turn out ok le. Any idea if I've over knead it? I spend an average 45 to 1 hour each time especially on those wet and sticky dough. I usually knead for around 30mins to get to the thin membrane stage. The dough shouldn't be over knead if it is done by hand. If your dough breaks easily (after kneading for an hour), becomes very slack, then may be it is over knead. On the other hand, I also read that even by hand kneading, we should not knead it for too long, as the dough would have started to 'proof' (plus the dough gets heat from our hand with the constant kneading/friction). Do you notice that after 30mins or so, the dough will start to have bubbles on the surface? I tried using this method of kneading, but it works well only if the dough is soft and elastic, for those dough that has less water content, ie stiffer dough, it is quite difficult to follow this method. I also had separation of different color doughs problem. I did roll tightly. Could it be I left it too long during 2nd rise? Actually I saw this clip before ...but i just have problem to get the thin membrane. So far I have no experience with the dough started to proof while I was still doing the kneading. Anyway, I will continue to "Jia Yu" until I manage to get the thin membrane one day! 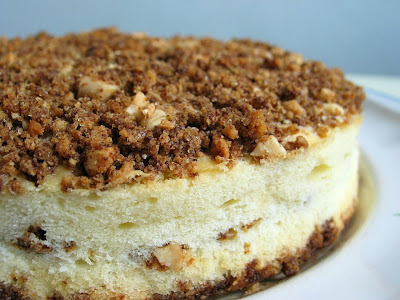 I'm loving it, this blog show me a lots of breads recipe together with beautiful picture. I'm a current student at Le Cordon Bleu college. I find this website is so useful for me. Thanks for sharing your work ! I wish I could have this for breakfast every morning...looks delicious! !